The scooter series features the popular three-wheel version and the all-new four-wheel scooter, the two most portable, easy to take anywhere, scooters on the market today! Both scooters quickly disassemble into four, lightweight, easy to transport pieces that fit in most trunks. 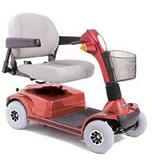 The four-wheel has a 300-pound weight capacity and a new, redesigned frame for fast and easy disassembly. 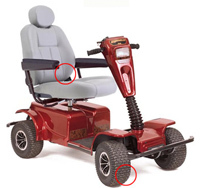 It also features a larger seat with more thigh support, and a quick-release battery box. The three-wheel scooter also has a 300 pound weight capacity and an operating range of up to 26 miles. Both models are stylish, affordable and highly portable! The NEW Pride offers elegant simplicity, unmatched reliability an impressive, easy-to-use performance and operation. The next generation styling of the is fresh and exciting, while the many standard features, developed directly from customer feedback, are extremely practical in everyday use. The is a perfect blend of style, performance technology, convenient standard features and affordable pricing making it the best over-all luxury scooter value in its class! 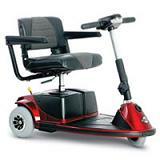 The Legend® Scooter combines the latest style and performance technology at a great value. 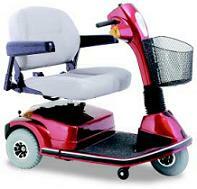 Standard features include a top speed of up to 5.75 mph, 350 lbs. 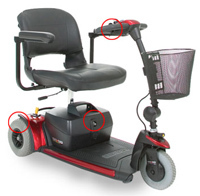 maximum weight capacity and an easy lock-up system for quick disassembly. Plus, the new lower dual-bulb headlight offers excellent pathway illumination. The Legend's sleek styling and advanced features will have you turning heads every time you turn a corner. 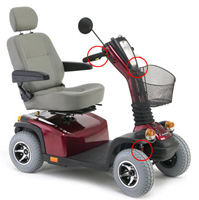 The Scooter combines outstanding performance and elegant styling together with rugged construction for increased weight capacity of up to 450 lbs! 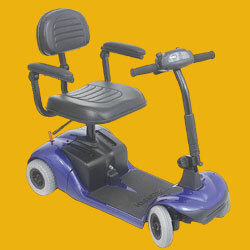 With a list of standard features like an easily adjustabl etiller, fully directional light package, 22" wide medium-back seat, 7-piece disassembly, front anti-tip wheels, ultra heavy-duty drive train, NF-22 battery capacity and enhanced rear suspension- the provides heavy-duty brawn with all of the convenience and comfort of a luxury scooter. The Revo® Electric Scooter is just the ticket for taller folks who value style, performance and economy. Though heavier and roomier than our smaller scooters (heaviest piece is 48 lbs. on 3-wheel model and 52 lbs. 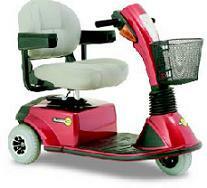 on the 4-wheel model), it disassembles easily, goes a bit faster and its battery yields twice the range. Contemporary styling and superb performance complement one another perfectly in the nimble luxury scooter, giving you the power, range, features and comfort that you demand to accomplish your daily activities. Don't let it's small size fool you- the is up to your challenges.